Ocean Mist I - Beachside vacation rental home in San Diego, California. Welcome to Ocean Mist I! 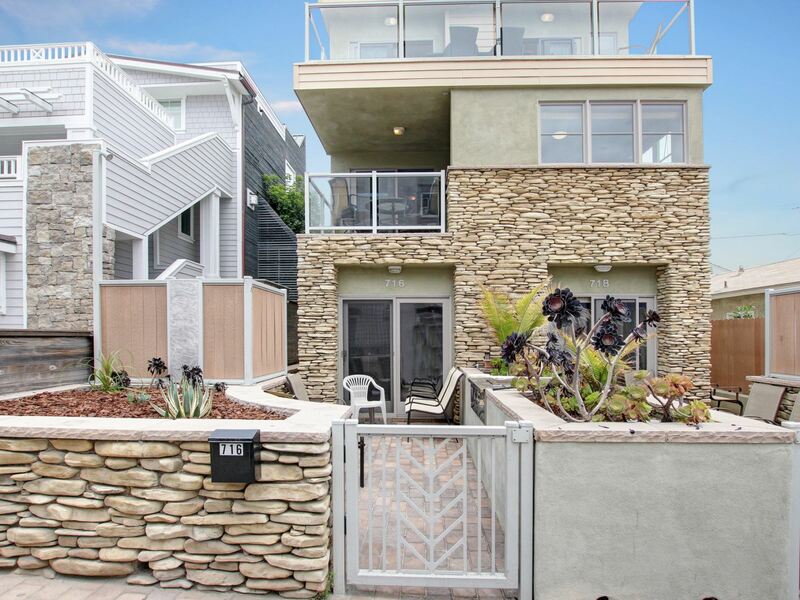 This beach-side home has 3 bedrooms, 2.5 baths, and a direct entry 2-car tandem garage. 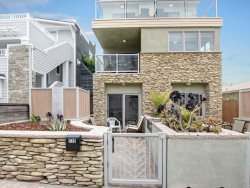 Located two doors from the ocean and on the third floor, this home offers incredible, panoramic views for everyone to enjoy on the large deck. Enjoy your morning coffee or tea with picturesque white water views and afterwards head out to the sands of Mission Beach, or a fun-filled day at Belmont Park or the amazing craft breweries and restaurants hosted by San Diego. Ocean Mist I's floor plan is truly unique. The property occupies half of the first floor and the entire third floor. The 3rd floor has the main living space with the kitchen, dining area and living room, private laundry area, 2 bedrooms and 2 full bathrooms. The living room and dining area have direct access to the full length view deck. Dining seating inside is appropriate for 6 persons. But why not enjoy the beautiful sunset and have dinner on the deck where there is also dining room for 6 persons. Need a nap after a day in the sun? The master bedroom has a king size bed with a private bathroom. The second bedroom offers a queen bed, private deck and bathroom across the hall. The third bedroom is on the first floor and has a Full/Twin Bunk Combo, TV, half bath and opens to the ground floor patio. The hallway has a private interior staircase leading to the 3rd floor. A private interior staircase and a gated outdoor staircase offer both privacy and security during your stay. For your outdoor cooking pleasure, Ocean Mist I has its own gated ground floor patio with a built-in gas BBQ and direct patio access to the interior. If you want to enjoy the view and be closer to the kitchen, we also provide an electric BBQ on the view deck. The outdoor shower lets you rinse off the sand, salt water, and sunscreen of the day. Ocean Mist I's style is modern and clean with new wood grain tile and plush new carpet in the bedrooms, alder wood cabinets in the kitchen, lots of natural light and windows. Amenities include a full-size stacked washer & dryer, cable TV, WIFI, central heat and air. There are also flat screen TV’s and a fully equipped kitchen with extra cupboard space. Everything you need in your home away from home is here for you! Planning a family reunion or larger group trip? Both 716 Island Court (Ocean Mist I) and 718 Island Court (Ocean Mist II) can be rented together to create one large living space for an occupancy up to 15. We call this is Ocean Mist III. There is a shared 4 car garage with designated tandem spaces to park 2 cars each. Together, these two properties are perfect for big families, birthday celebrations, special anniversaries, and any other occasion that calls for a beach-front stay! We look forward to seeing you at Ocean Mist I soon! We enjoyed our stay and we love the unit and the location. Staying in the other unit this time was great in many ways. We enjoyed having the bigger balcony and the décor and flooring was nice. We did however experience an ant problem again (just like last year). We noticed it early on and took care of it with the ant spray that was in the utility closet, so we didn’t contact you. It was also nice to finally meet you (and Cheryl as well). I just wanted to let you know about the few issues we had so that maybe it will help you in the future.